Farmhouse Antiques is much more than a typical antiques store. With an emphasis on the country kitchen, dining room, keeping room, and garden styles, we maintain a discriminating collection of primitive accessories, furniture, collectibles and curiosities. Our extensive inventory is creatively displayed in beautiful vignettes making a visit to Farmhouse Antiques an experience in itself. 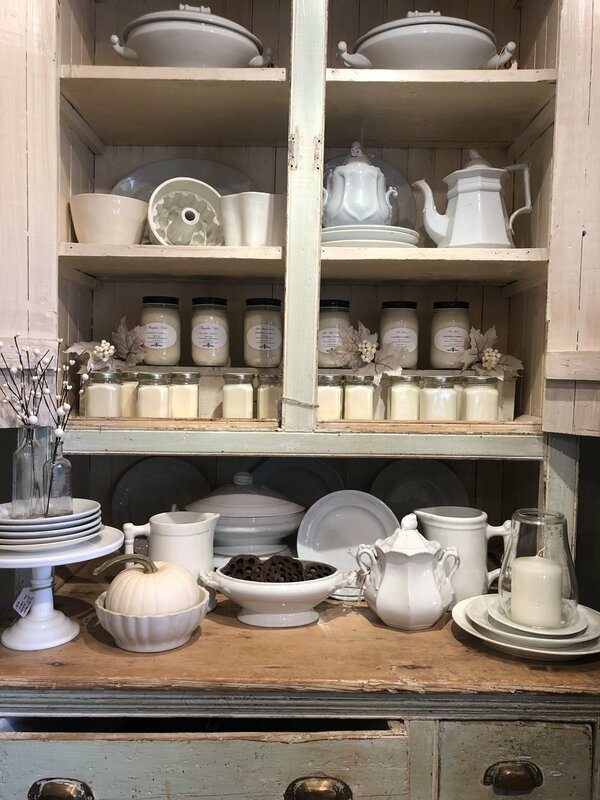 Complimenting our antique and vintage inventory are locally hand poured soy candles, soaps, artisan made gifts, unique lighting, pillows and more. Through our on-site workshop we have the ability to adapt our pieces to suit our customers needs. From custom painting, altering the size and function of a piece, to total restoration we pride ourselves in offering an alternative to the typical “take it or leave it” approach to retail that you will find in most antiques shops. See our Portfolio section for a look at some of our past one of a kind creations.